Many disabled cyclists ride a solo bicycle with no adaptations at all. Some may find it easier to mount an open-frame, step through or ‘Lady’s’ bicycle with no top-tube to lift their leg over. A small-wheeled folding bicycle will usually have an open, step-through, frame. The lower center of gravity may also be helpful. Small-wheeled cycles often have lower gearing than a full-size bicycle (because the gearing has not been adjusted to compensate fully for the smaller wheel) and this may be helpful. A folding bicycle has the advantage that it can easily be fitted into a car or carried on a train or bus. There are two types of electric cycle: a Pedelec, where the rider must pedal in order to activate the motor, and an e-bike, where the motor is controlled with a switch and can be turned on when required, whether the rider is pedaling or not. An electric tricycle or an electric bicycle with a trailer can be powered with a car battery or similar, greatly extending the range, if the voltage is appropriate. These have four wheels and are designed for fun on a track or off-road setting, rather than on the road. Who needs legs to cycle? Hand Cycles enable you to pedal or ‘crank’ with your arms and provide great exercise for the upper body. Hand Cycles have three wheels and range from upright models with wheelchair-type seats to recumbent models with seating that is leaning back and lower to the ground. There are hand cycles adaptations that can be fitted directly to regular wheelchairs. Some are built with a combined drive so the rider can use both hands and feet, there are also a variety of tandem hand cycles. 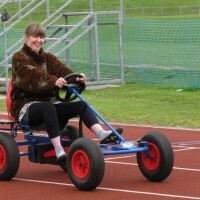 Tricycles are great for balance, for cycling at a slow speed, and for regaining confidence after a break from cycling. They are designed with two wheels at the back and one at the front, or the reverse. Many come with a rear basket so are a great solution for transporting shopping or luggage. Tricycles are suitable for riding on even surfaces with few potholes. 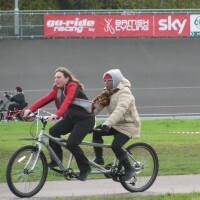 Tandems are great for sighted and non-sighted riders to cycle and balance the tandem together. They can also be designed with a lower rear seat for a smaller rider, or with a smaller seat at the front which can be helpful for supervision. Like solo tricycles, tandem tricycles are an option if one of the partners needs balance support or is unable to put a foot down when stopping. Trailer cycles attach to the seat-post of a cycle and carry a child, who can pedal to contribute to progress. The adult rider on the cycle has control of steering and braking. Some models come with two wheels for extra stability if the child is unable to balance. It is also possible to get an adaptation which lifts the front wheel of the child’s own cycle off the ground and converts it into a trailer cycle so that the adult has more control when cycling on road. These cycles are great for back support, reducing pressure on knees and hips, and sharing steering and pedalling. They have three wheels and riders sit next to each other, in an upright or recumbent position. They can be designed for one or both riders to pedal and steer. Side-by-side cycles are intended for use on a track or off-road setting. Companion cycles have a wheelchair or a seat for a wheelchair user, and a cycle seat for somebody to steer and pedal. They can be designed for a wheelchair to be clipped into a cycle frame, or carried on a cycle so that the user does not have to transfer. They are generally intended for use on a track or off-road setting, rather than on the road.